The first time I received the Lord’s Supper, I believe, was while I was in seminary. Since I was confirmed as a youth I had often received the bread and cup. One of my earliest memories of the church is the taste of communion. As a student pastor I served communion in my parish. But I think I never partook of it sacramentally until one day in the early 1980s, and then it wasn’t even in a church. Feeling more fatigued than usual after leading a Sunday worship service, I drove to a newly opened restaurant for lunch. It was an attractive, well-designed place, doing a brisk business, and as I waited for my meal I began to pay attention to the people and décor around me. The dining area, appointed with warm wood and lots of greenery, was painted in soothing shades of gray and was gently lit. Soft music played in the background. The wait staff, decked out in Izod and khakis, was efficiently taking and serving orders. Through a large window at the far end of the dining area, I could see chefs working at their creations. Then I started noticing the other diners around me. At the next table were two people who looked as if they might be Hell’s Angels. Near the serving window, two businessmen poured over paperwork while sipping drinks. To my right a Korean couple talked with their children in their native language. A few other diners – singles, couples, small groups – were scattered throughout the room, talking about who-knows-what over their meals or while they waited. As I settled in and my energy began to return, it suddenly dawned on me: Despite all our differences of background and language and interest, we all had one thing in common. All the furnishings and decorations, all the wait staff and kitchen staff, even all of us diners with all of our differences – everything was organized around one single thing, the simple act of lifting fork from plate to mouth, yet it was the one thing to which almost no one appeared to be giving their attention. In that moment of recognition, Sunday dinner became a sacrament of the Lord’s presence, and I was bound together with every other person there. Was it like that during Jesus’ last meal with his friends? Think about the conversation that evening. Was there some continuing discussion about who was greatest among them? Were they still griping about the guy who was casting out demons in Jesus’ name but wasn’t part of their group, and were they still sorting out who had the right to speak and act for the church? Could we have detected seeds of differences that would grow into the church’s disagreement about the meaning of that meal and result in this late gospel of John leaving it out entirely? Judas was there, so perhaps we could hear the tension about financial stewardship that was soon to boil over in betrayal. Did anyone there have a clue what was happening beneath their notice, how they were being fed? And what about the conversation that surrounds us today? This is perhaps one of the most bittersweet celebrations of the Lord’s Supper I have attended. Here we are, Lutherans and United Methodists, sharing this sacrament of unity in the name of Christ, building bridges across boundaries of tradition and theology, feasting on the one Lord who makes us one. It’s a great celebration. And here we are, Methodists, in our most contentious discussion of schism that has occurred since our denomination united in 1968, wrangling over the issue of gay marriage and ordination. And here you are, Lutherans, recalling your schism just a few years ago over, at least partly, the same issue. And if it’s not this issue, it’s some other that breaks us apart or keeps us apart: transubstantiation in the Eucharist; wine or grape juice; birth control; abortion; stem-cell research – you name it. 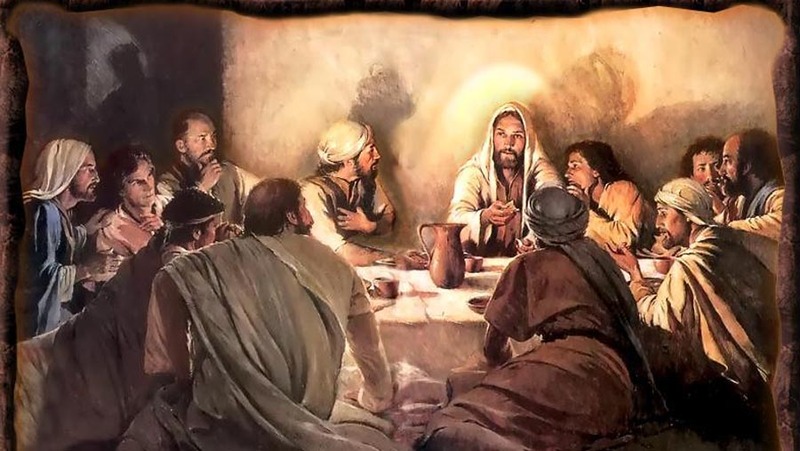 Sometimes I wonder if we in the church have become so distracted by our conversations and disagreements that we have forgotten the holy banquet that is spread under our noses. When will grace bring us to our senses so that we see how graciously and universally God feeds us? When will we remember that we are all, every one of us, hungry beggars who have been given a place at a bountiful table? “Having loved his own who were in the world, [Jesus] loved them to the end” (John 13:1b). Does that mean Christ loves us still, those of us who are still in the world? Yes, I believe it does. Does it mean we will love each other – value each other as essential to God’s work in the world – even if we take radically different sides on critical issues of faith, even if we have trouble living and worshiping together under the same roof? I hope so. I pray so. In his sermon “Catholic Spirit,” I believe John Wesley gave us a way to do so – in what might be considered an eighteenth-century version of Rodney King’s plea, “Can’t we all just get along” – when he said: If your heart is as true to mine as mine is to yours, if you are as committed to me as I am to you, give me your hand. We may not all think alike or practice our faith alike, even on critical issues, but can we not love alike? May we not be of one heart, even though we are not of one opinion? God doesn’t call us to think alike or practice our faith alike. God calls us to love alike, to value one another with the same intent and commitment with which Christ loves us, and to stay at the table with one another despite our distracting conversations and disagreements. For here Christ feeds all of us with the bread of heaven, and we drink the cup of true and abundant life together.